The morning found us at a rest stop somewhere in Massachusetts on the way to Albany, NY from Portland, ME. We had an amazing time at the Portland show the night before. We met a bunch of awesome people and I got to hear the Lonely I'd been dying for! We had driven eight hours from Rochester, NY to Portland, ME so after the show we decided to head back down the highway toward NY and stop whenever we got tired. My hometown is close to Albany so this was essentially a hometown show for Delaney, Kyle and I, as well as the last northeast date of the Fall Tour. Kyle had been following the band ever since the Ithaca show, so it was great to meet up with him in Portland and bring it back home for the grand finale. After refueling at my parents' house, eating some pizza and taking a nap, it was showtime before we knew it! The written location of the venue is deceiving, I'm sure you're thinking it's some club in the middle of the city, right? Exactly opposite. The venue is actually in Crossgates Mall, inside of an adult arcade that also has a bowling alley, arcade games, a bar and a restaurant. We met up with Kyle and his parents in the parking lot before the show (they are deadheads and had a great time at the show BTW!) We don't return home that often and get to see Kyle's parents even less, so it was a nice little reunion to start off a great night! We walked into the mall to see Spafford, something I didn't think I'd ever say! We saw a bunch of people headed into the venue at the same time, sporting moe. and dead gear, and I could just tell that it would be a great vibe inside. We wandered down a hallway and opened two huge doors to walk into the room that they were playing in. It was surprisingly nice on the inside. It was built just this year and had a bar, a bunch of couches on a tiered section of the floor, and a lot of open floor space. We wandered to the front to find some friends that we had seen at the Ithaca show exactly a week ago, and passed the time talking about Spafford, of course! I went around the room and handed out stickers, dishing out the last of the northeast ones since this would be my last show of the tour. Everyone was appreciative of the stickers, and just like at the Ithaca show, I could sense the excitement of everyone seeing Spafford for the first time. The show started off unexpectedly with a Simon & Lily opener, which was nice to hear live for the first time, and started off the show with a great upbeat vibe. They haven't jammed this one out yet, but I'm just waiting for the day that they do! Once Brian ripped into the opening chords of Galisteo Way, you knew that they meant business tonight. The room had filled in nicely, the floor was populated, there were people lounging in the couches, and there was even a taper there! This Galisteo Way packs a bunch at just over 11 minutes long with a nice jam section, but I may be partial because I love this song. Mind's Unchained slowed the pace down a little bit and brought out a patient jam with great playing all around and some special sprinkles from Red in-between Brian's licks. This is a song I'll never get tired of hearing. If you're listening to the SBD of this show, listen closely at the end of this track and you'll hear Kyle and I asking the guys if they went shopping today. Brian showed off his brand new shoes and was like "We're at a mall, yeah! I went to a shoe store!" People is one of the Red songs that I love - every time he sings or stands, you know you're in for a treat! Soul To Squeeze-- I didn't even really know the original song, but I've come to love it after hearing Spafford's version. Brian gave us a quick solo here that shows off his skills on the fretboard. It was a feel-good follow up to the heavy hitting People before, and brought us nicely right into a Windmill set-closer. This song is a masterpiece and had Kyle's parents yelling out with the crowd. One of my favorite Spafford lyrics come from this one - "Through this riff my troubles' lost..." This is one of those moments where you know all of the first-timers just converted to Spaffnerds, and it was a perfect way to close out the set. I actually lost my voice the night before in Portland from yelling so much with an already sore throat but I couldn't help but yell some more tonight and completely destroy it! Setbreak featured a run-in with mall security and 50 or so people from the show hanging out and smoking outside the mall. The mall property is actually smoke and tobacco free, adding to the weirdness of the venue. We talked to a bunch of people who were amazed at the performance so far. Most people seemed to have never listened to Spafford at all , which definitely makes for a surprise when they actually hear the music and fall in love with it! We walked through a maze of arcade games and bowling lanes to get to the bathroom in the venue, and got back just in time for the set two opener. Flashback 12 or so hours and it's 10 AM at another sketchy rest stop. I'm groggily rolling off of the air mattress and out of the side door of my parents' Honda Pilot. My bare feet hit the wet asphalt and I'm greeted by a mountain of empty Bud Light cans that seem to have accumulated next to my car overnight...I'm not going to miss sleeping at rest stops. It's my last morning on tour and my first time seeing rain all week. Fitting, I guess. Having been raised by a flock of Deadheads I have naturally always dreamed of going on tour. My family had brought me along to shows since a young age and I spent my teenage years fantasizing about life on the road. Well, this time last year I hardly knew the band Spafford. They were just one out of a hundred bands Cody was recommending to me at the time. But this fall, they were the band that finally helped my touring dream become a reality, if only for a little while. I was incredibly blessed with the opportunity to go to a large majority of the Northeast run of this tour-- from Ithaca 10/1 through Albany 10/8. During this time I was lucky enough to spend a decent amount of time conversing with Spafford, band and crew alike, and had the chance to tell Brian the entire backstory of my tour run. So, after the show in Portland the night before, @jaredsusername and I ran into Jordan and his girlfriend Lizzie outside of the venue and talked for a few minutes. Before long, Brian materialized and said, "Tomorrow night, Albany, that's your last hurrah right? Is there anything in particular you want to hear??" At this point in the week I had heard A LOT of songs, and there was only one thing left that I was still dying to hear. The elusive Alternate Ending. I told him this and admitted that "I knew" we weren't going to get that because they had just played a fire version of Electric Taco Stand > Dis Go In 5? > Electric Taco Stand the night before in Cambridge. He replied, "That probably isn't going to happen. There's like a two percent chance. But hey, there's still that two percent!" Flash forward to Albany, mid set 2, and we find ourselves amidst a ferocious Bee Jam. I've always loved the intense energy this song carries. Brian shouting at me with his guitar just makes me want to head bang or jump up and down. Spafford is an improvisational monster and in this Bee Jam the monster digs its feet in the sand and rears its ugly head. Starting with a classic funk jam that is mostly lead by Red, it morphs promptly into some deep dark territory. The darkness moves and the tension grows until Brian shreds his way through an aggressive peak. And just like that, they break through the clouds and the light shines through. The key changes and the ever so blissful sounds of Alternate Ending begin to pour into my ears. "I can't believe they're really doing it," I exclaimed aloud to myself! I hugged a stranger. I hugged Cody. 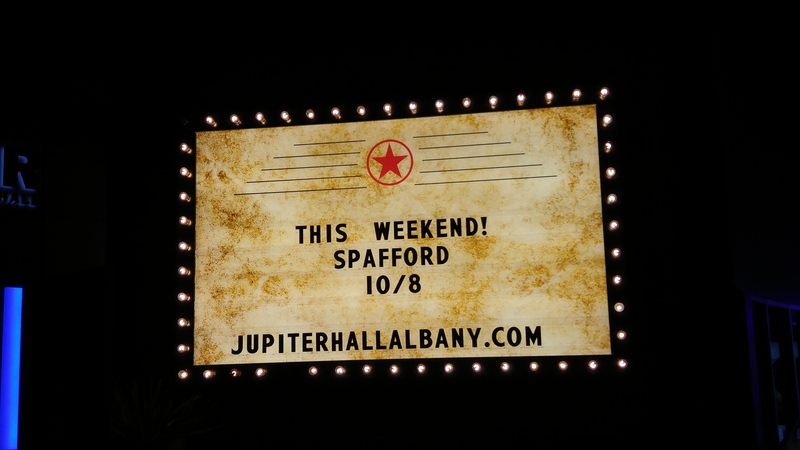 I hugged my Mom, who was lucky enough to be experiencing her first Spafford show that night, and she told me, "This is one of those moments you will remember forever." I get the feeling that she was right. Alternate Ending has always evoked an incredible emotional depth in me. Something about that screaming melody takes me to a place that few songs have the ability to take me to. I think it is important to note that this particular version was the first version played without an accompanying Electric Taco Stand. Brian's beautiful bends had picked us up out of that blissful Alternate Ending and dropped us hard into a super danceable funk groove that I could have sworn was going to be the second half of Electric Taco Stand. But then out of the blue come the fast-paced lyrics of Ain't That Wrong. This was the quintessential type 2 jam of the night. Clocking in at just under 25 minutes, it took us through multiple moving parts with varying keys and time signatures. This roughly half-hour segment was the ultimate display of Spafford's improvisational abilities. Beyond the jam, I love the lyrics in this song: The second set of the last show during my seven-show run ended with the words "Take that home!" The boys came back out to encore with a classic, super-bluesy rendition of Shake You Loose. This was a good choice to calm everyone down a bit before sending us off into the cool October night. As soon as the show ended, I made sure that Brian heard me thank him for giving me my Alternate Ending. He chuckled a little, held up two fingers like a peace sign, and said, "Two percent." And with that, the Northeast run of the Fall 2017 tour was over as quickly as it had came. These shows represent Cam's first proper tour with the band, and if the performances indicate anything, we have a long and bright future as Spaffnerds. With that being said, head over to This Thread to vote for best jam of the fall tour. I mean... you get to watch Spafford 2 nights in a row from Asheville and all it costs you is the bandwidth you're already paying for. THIS is living the dream! Click below for the stream. Not really sure what to say here except you get to listen to Spafford tonight from your home and it doesn't cost you a penny. You know who's going to tune this in??? @crappygeorge. Be like @crappygeorge and listen. Click the link below to go to the stream. Spafford has announced their first festival show for 2018. They'll be playing at Centennial Park in Atlanta Georgia as part of the Sweetwater 420 Festival. Go figure, it's on April 20th. When I met @Brian-S-Lake in Alpharetta a number of years ago, he preached the wonders of Sweetwater 420 to me. We even road in a van with a wild dude and his dog named Otto in order to cross state lines and buy some. Then we drank delicious beer while rafting down the Chatahoochie river and we celebrated a truly Superior 4th of July.